Spa 56 Granular Chlorine is a spa and hot tub sanitizer made by Leisure Time. It can be used on a regular maintenance basis or as a strong shock. Spa 56 Granular Chlorine is sodium di-chlor that features a strong 56% pure chlorine. It comes in a granular format that does not need to be pre-dissolved. Instead, it's easily added and dissolved in spa water to deliver purifying chlorine immediately, and the formula does not add unwanted calcium or leave residue in the water. Sodium di-chlor and pure chlorine is used most frequently as a heavy duty sanitizer. It kills bacteria, algae and contaminants that are frequently present in spa water. It also destroys foreign organic material that comes from human use. 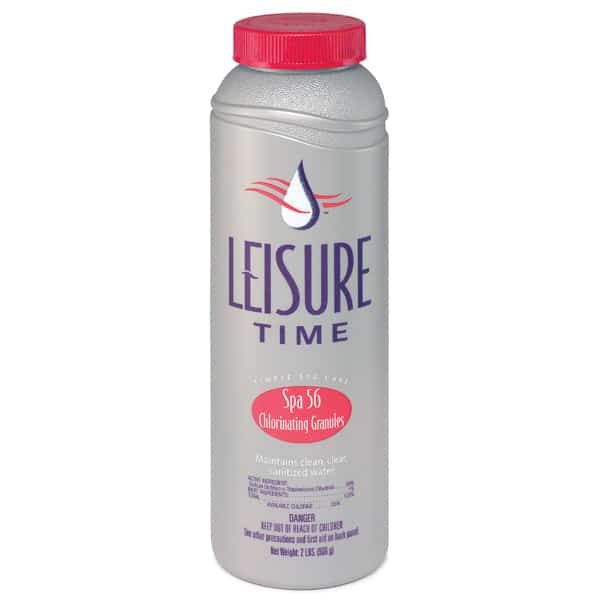 Spa 56 Granular Chlorine from Leisure Time is a high quality chlorine source for spas and hot tubs with flexible use and reliable results. Broadcast directly into spa water with jets running. After adding wait 5 minutes to soak.